It wasn’t until I actually downloaded this photo that I noticed the larger design. 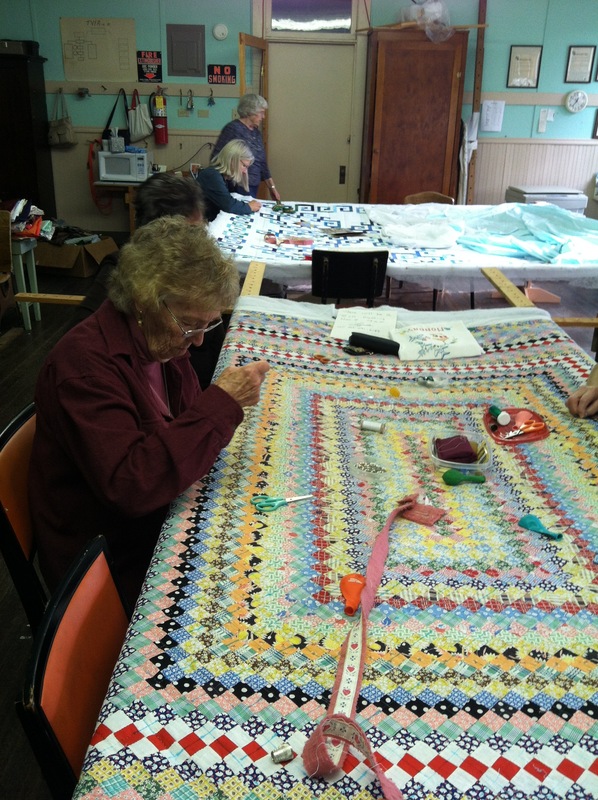 For hours on Friday we sewed on this beautiful quilt pieced by Dianne’s sister. During that time I examined the amazing number of fabrics she had used – greens, blues and whites. And although our quilters usually don’t enjoy sewing batiks or using white thread on white fabric, no one is complaining as the fabrics are soft and the design intriguing. It is going to take us a while though to finish it. We’ve been at this quilt for three weeks and only just turned at the end of our Friday session. When I got home after quilting and looked at the photo of Joan sewing on this particular quilt, I realized that often I lack the perspective one gets with distance. I put my focus on the immediate, on the task at hand and rarely take the time to look at how the pieces fit together in a larger sense. There are the dishes in the sink that need to be washed and the birthday card I meant to mail a week ago. Work is piled up at the office and I suppose some folks are even getting ready for the holidays. I get so busy doing the list of things in front of me though that I rarely take the time to appreciate the wholeness, the entirety. Maybe winter settling in and regular Fridays quilting with these women will help me look up a bit more to glimpse the integrated design. Someone dropped off a box of fabrics. Most of them couldn’t be used in quilts but each of us had other ideas. Carmen is making something with polka dots (wouldn’t say exactly what). I hope to make hats for the bazaar. Judy pointed out how amazing it was that we each saw different treasures when we looked through the box. I’m drawn to the bright colors and anything with spar kles. Cathryn sensibly pulled out flannels that could be transformed into baby quilts. Not surprising as isn’t that what variety offers? We go into a restaurant with friends and each person orders a different item off the menu. Dianne got a new car recently and was willing to drive to Butte to get the red one. 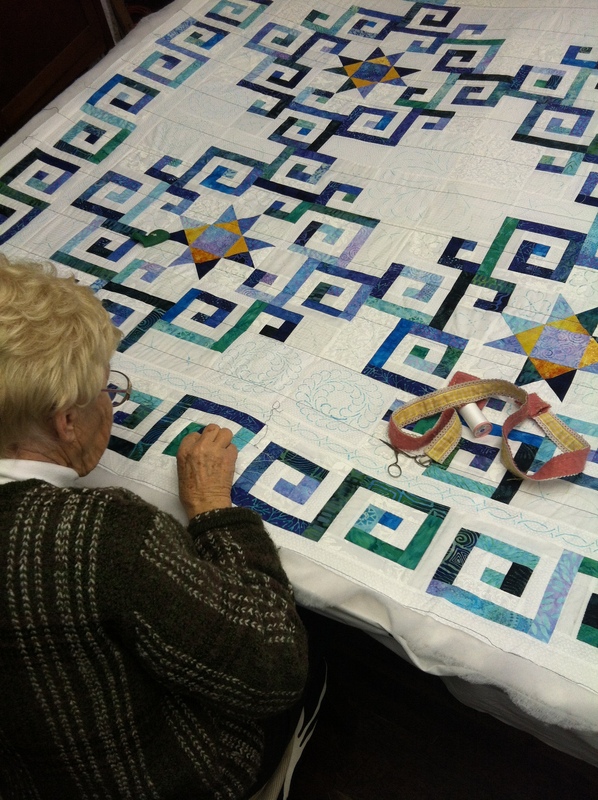 The new quilt we started on looks like it holds blues on a white background but when we looked closer – the background was actually composed of many different sorts of white fabric. There are aspects of our lives where we savor routine – morning coffee, old friends, Thanksgiving dinner, Friday quilting. At other times we very much want choices. That joy when we can look in a box and see some special thing that speaks to us and other things that we barely notice. Imagine it is the same with people. How many individuals do I pass on the street in a given day that I don’t notice? Why is that? What makes one piece of fabric instantly catch my eye? Why do I notice the woman with a small child crossing the street and not the other pedestrians passing me on the sidewalk? I could have been pondering this while quilting today but I didn’t. Too busy trying to make those small even stitches.